I was reading an article recently about the link between community and health. The article was about people in a town in England that were experiencing improved health and significantly fewer hospital visits after increasing their community outreach and involvement. I wasn’t surprised. We are social creatures. We sometimes forget and think that only babies need loving care, touch, nurturing; but actually, we all do, for life. When I am sitting in the community clinic observing 7 or 8 people resting in a recliner, I can feel the truth of community = health. Nearly every day that I am there, someone comments about the power of resting in a room with others. When I sit in the yoga studio surrounded by other yogis I feel a warmth in my heart that always nourishes my spirit, and I can see this reflected back to me in the eyes and smiles of those practicing with me. 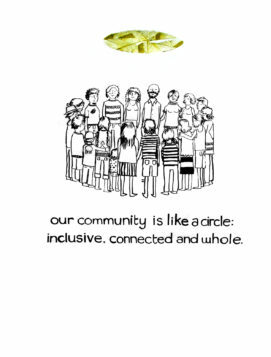 I feel so grateful that together we have created a place that can nurture us individually, and collectively, through our shared experience. Thank you for being a part of this important community of health and healing!